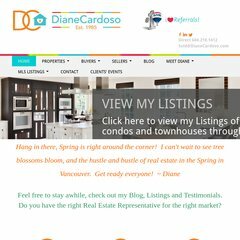 Topics: Diane Cardoso, Re/max Westcoast, Properties, Active Listings, & Mls Listings. ns2.ubertor.com, & ns1.ubertor.com are its DNS Nameservers. The programming language environment is PHP/5.2.4. It is hosted by Amazon.com Inc (Virginia, Ashburn,) using nginx/0 web server. PING www. (75.101.149.239) 56(84) bytes of data. Pinging the server, resulted in a 26.9 ms response.